The Montreal Canadiens have had a nice start to the season with an 8-5-3 record to start the season. However, more good news could be on the way as there was a Shea Weber sighting today as the veteran defenseman took the ice this morning along with David Schlemko, Brendan Gallagher, Noah Juulsen and Carey Price, according to TVA’s Renaud Lavoie. The team captain was originally scheduled to return sometime in December, so it still may be a while before he fully returns, but this is a step in the right direction for the veteran. Weber could add another key element to a young team that seems to have found some offense from a number of young names and gotten some solid goaltending from Price. Adding Weber to their blueline could only make the team stronger as they start hitting the middle of their season schedule. The Detroit Red Wings like what they see from winger Andreas Athanasiou so far this year. What the 24-year-old has always lacked was competive consistency, which they are finally starting to see everyday, according to MLive’s Ansar Khan. Athanasiou has always had the speed that many people felt he could put up big numbers if he figured things out. However, the best the Red Wings have gotten out of him has been 18 goals, two years ago. Through 13 games so far this season, he already has six goals and nine points and doesn’t show any signs of slowing down. “I know those chances are going to come, so it’s just playing hard when I get out there and capitalizing on those chances,” Athanasiou said. George Richards of The Athletic (subscription required) writes that Florida Panthers defenseman Mark Pysyk remains a healthy scratch for the seventh straight time despite being medically cleared to play again on Thursday, but can’t seem to work his way back into Florida’s lineup. He was knocked out of the lineup after taking a hit from Washington’s Alex Ovechkin on Oct. 19. The hope is he will be in the lineup on Sunday. The Tampa Bay Lightning announced that defenseman Anton Stralman and forward Adam Erne were out tonight and are listed as day-to-day, both with upper-body injuries. With the return of defenseman Victor Hedman, it looked as if the team’s defense was almost healthy. Instead, the team will be without Stralman for the time being, who was the one to fill many of Hedman’s minutes. Slater Koekkoek remains in the lineup. Though he isn’t expected back on the ice for several months, Shea Weber has been named the next captain of the Montreal Canadiens. The team had a vacancy in the role since trading Max Pacioretty earlier this offseason, and Weber seemed the easy choice. The team has also named Paul Byron and Brendan Gallagher as alternates for the upcoming season. Interestingly, the accompanying press release notes that the decision was made by team management. 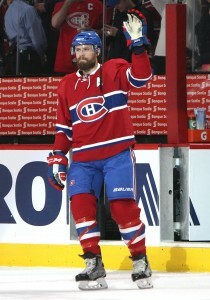 Weber, 33, came to the Canadiens by way of trade in 2016, leaving the Nashville Predators behind in a swap for P.K. Subban. Weber had been serving as the Predators captain, and quickly took on a leadership role with his new club in Montreal. Unfortunately, after playing in 78 games during his first season with the Canadiens Weber was limited to just 26 contests in 2017-18 and is expected to be out until December this time around. Those injury woes are concerning for Montreal, as their new captain heads into the latter stage of his career with some chronic issues and uncertainty surrounding his level of play upon returning. 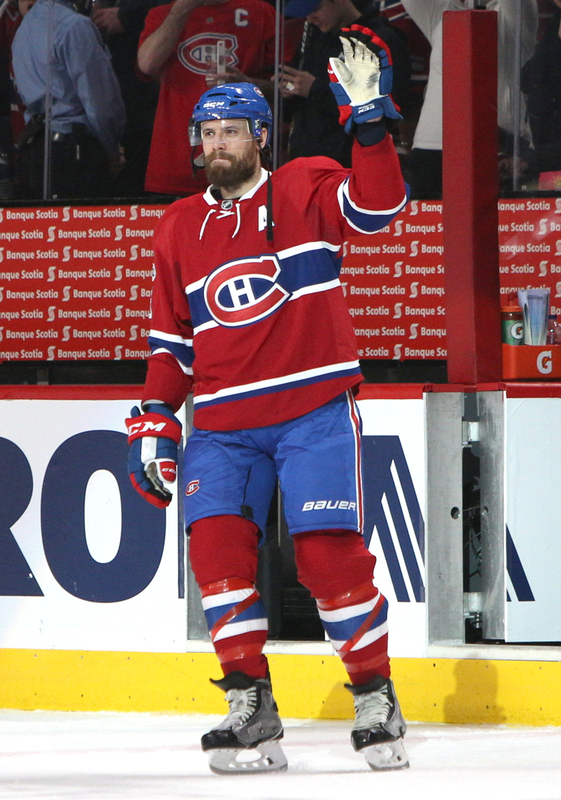 Still, there little doubt that Weber would be named the 30th captain in franchise history. Among the most well respected players in the NHL, the big defenseman has been known for his excellent two-way play for more than a decade and has been a Norris Trophy finalist several times. In fact, before his injury-shortened 2017-18 campaign Weber had finished in the top ten in Norris voting for nine consecutive seasons, though he has never actually won the award. Other than the Norris and the still-elusive Stanley Cup though, Weber has had tremendous success throughout his hockey career. A two-time Olympic gold medalist with Team Canada, Weber has also won a WHL Championship, Memorial Cup, World Cup, World Championship, and World Junior Championship. If he ever were to raise the Stanley Cup, he’d enter a very exclusive club with titles at nearly every level of play both domestic and internationally. Still, that’s a tough ask for Weber and the Canadiens given the current state of the organization. After Pacioretty’s departure and some offseason injuries, there are very low expectations for Montreal as the season begins and an extremely tough Atlantic Division ready to pounce on any weakness. With teams like the Tampa Bay Lightning, Boston Bruins and Toronto Maple Leafs all considered legitimate Cup contenders, it would be a surprise to see the Canadiens push for the playoffs this season. With that said, a healthy Carey Price from the beginning of the season, impressive young players like Jesperi Kotkaniemi making their debuts, and a potential mid-season return from their new captain could lead to some surprising results for the franchise. Weber will be tasked with keeping this group’s focus over the coming months, until he can get onto the ice with them on a daily basis and lead by example during games. While surprise probably isn’t the correct word, the Montreal Canadiens announced that head coach Claude Julien confirmed that 18-year-old prospect Jesperi Kotkaniemi will start the season in Montreal. No word on where he might play or even what position he might play out of the gate. “We decided that he’ll start the season here in Montreal. It’s good news for him, and it’s good news for us,” said Julien. The 2018 third-overall pick has been debated for weeks now about whether or not he should remain with the team. While the team is desperate for help down the middle, Kotkaniemi has not played center on a regular basis in over a year as he played left wing this past season with Liiga’s Assat Pori team as a 17-year-old. With the team already having abandoned the Jonathan Drouin experiment at center and only getting a minimal look at Max Domi as their No. 1 center before being suspended for the remainder of the preseason, the team may be hoping that Kotkaniemi can work his way into the role at some point during the season. Kotkaniemi was already somewhat of a mild surprise when the Canadiens took him with the third overall pick when there were better-known wingers ahead of him, including Brady Tkachuk and Filip Zadina, but it is believed that the Canadiens fell in love with Kotkaniemi’s potential as a future No. 1 center, which now looks to be immediate. The team is allowed to play him for nine games before they burn the first year of his entry-level contract. The team may want to see how he responds to playing in the regular season before making a final decision on whether to keep him, send him to the AHL’s Laval Rocket or return him to Finland. One other interesting point made by The Athletic’s Arpon Basu (subscription required) is that the salary cap specifics could fit perfectly if the team keeps Kotkaniemi this season. He points out that if Kotkaniemi does play more than 10 games this season, then he will sign his second NHL contract in 2021-22 when the Canadiens have freed themselves of some significant cap room, including the contracts of Tomas Tatar, Brendan Gallagher, Jeff Petry and Phillip Danault (assuming none of them get extended). It’s also significant, because the team has quite a few other prospects that are a year behind Kotkaniemi such as Nick Suzuki, Ryan Poehling as well as a potential high pick in the 2019 NHL draft who could hit a big payday in 2022-23 and might have Montreal thinking ahead to avoid having all three get paid in the same year. Despite some speculation from the fan base that Paul Byron might be the next player out the door for the Montreal Canadiens, Byron himself confirmed last week that he was in talks for a contract extension with the team. Those talks have proved fruitful, as the Canadiens announced a new four-year, $13.6MM contract with the veteran forward. Byron has one year remaining on his current contract at $1.17MM, but will get a hefty raise to $3.4MM per year on average through 2022-23. TSN’s Pierre LeBrun adds that Byron’s contract does not contain any trade protections and will pay him $4MM in years one and three and $2.8MM in years two and four. This move lines up nicely with what Montreal wants to do over the course of the contract: continue to be competitive while rebuilding their core. Byron has been a great fit for the Habs since coming over from the Calgary Flames via waivers early in the 2015-16 season. Byron has recorded more points in Montreal over the past two seasons (78) than he did his first 200 NHL games prior (66), including a career-high 43 in 2016-17. He has also proven to be a dependable and durable player, skating in all but one game and logging new highs in ice time in the past two years. One could argue that no Canadien has been more consistent than Byron over the past two seasons, who now has the security to further transition into a leader in the locker room. The versatile forward joins a new Canadiens’ top six of Jonathan Drouin, Tomas Tatar, Brendan Gallagher, Max Domi, and Phillip Danault, all signed on for multiple seasons with the team. A good checker, penalty killer, and all-around two-way contributor, Byron has blossomed into a balanced player who should provide responsible play up front for years to come for the Canadiens. Byron may not have the same name value as some of this teammates or others in the mid-$3MM salary range, but make no mistake – this is a savvy signing by Montreal to lock up a very capable player. Joshua Ho-Sang hasn’t had the season many were hoping for this year, and he doesn’t really think it’s all his fault. Ho-Sang has played in just 22 games at the NHL level, scoring 12 points but spending most of the season in the AHL once again. He spoke to Arthur Staple of The Athletic (subscription required) about it, and was quite candid in his approach. I love those guys, I want to make that clear,” Ho-Sang said of his former Islanders teammates. “I know they’re working hard. But I got sent down for defense and what are they in goals against in the NHL? I only played (22) games up there this year. I don’t think it’s my fault. They really painted it like it was my fault at the beginning of the year and I didn’t like that. Obviously there is more than just defense in the critique of Ho-Sang’s game, and Staple does a wonderful job breaking down what has happened between the two sides, including quotes from GM Garth Snow. It’s a very interesting situation to keep an eye on, as Ho-Sang has all the offensive talent in the world and is still an important part of the Islanders’ future. Carey Price won’t play in the upcoming World Championships, instead focusing on his health and being ready for the 2018-19 season with the Montreal Canadiens. Price has had a tough season battling through injuries, and putting up the lowest save percentage of his career at just .902. About to start an eight-year, $84MM contract, he’s the key to any potential Canadiens bounce back next season and down the road. Brendan Gallagher also won’t suit up at the Worlds, while Alex Galchenyuk is still weighing a decision. Also from the staff at The Athletic, Scott Powers reports (subscription required) that Ian Mitchell will not turn pro this summer and instead is expected to return to the University of Denver for his sophomore year. Mitchell, 19, was selected in the second round by the Chicago Blackhawks last June and excelled in his first year for DU. 30 points in 41 games easily led the club’s defensemen in scoring, and he should take another step forward next year to be one of the nation’s most dangerous offensive blueliners. Who Is On Pace To Score 60 Points In 2017-18? In 2016-17, only 42 NHLers hit the 60-point benchmark for the season. It was the lowest total since the 2012-13 lockout-shortened season (obviously), when only Martin St. Louis notched sixty, and down eleven from the 53 players who hit the mark two years earlier in 2014-15. However, with scoring up this season in the NHL, will the league increase it’s number of top scorers? Or will a greater depth and distribution of talent continue to limit players from reaching the high numbers of yesteryear? So there you have it. If these 77 skaters stay healthy, the 2017-18 season will easily surpass the down 2016-17 campaign could come close to doubling that number of skaters to score 60+ points, setting a new high since the last lockout in the process. Of course, health is always the main factor and the reason why players who were previously on pace for 60+ points (Jaden Schwartz, Mark Scheifele, Filip Forsberg, Logan Couture, Tyson Barrie) are currently impossible to project. They could just as easily bounce back quickly from injury and make this benchmark as they could struggle to return to health and miss it. Will all 75 of these players hit 60+ points? Probably not, though for each one that drops out, another player such as Thomas Vanek, Alex Pietrangelo, David Krejci, William Nylander or Brent Burns could go on a hot streak and jump right into the mix. For now, this is the the current picture in the race to 60 points. Lightning, Islanders, and Flyers stars make up the top six projected scorers, with Nikita Kucherov way ahead of everybody. Kucherov could potentially outscore talented teammates Victor Hedman and Tyler Johnson combined. Tampa is joined by Vegas with six players apiece on the list; that’s two teams making up 16% of the league’s top scorers. Add in the Isles’ five players and you have three teams with a 23% share. The Montreal Canadiens are the only team without a player trending toward 60+ points and they aren’t even close. Phillip Danault, Brendan Gallagher, and Alex Galchenyuk are all only on pace for 44 points. How about Kings veteran Dustin Brown on pace for 62 points after five straight seasons of failing to crack 40? Or rarely talked-about Bruins rookie Danton Heinen eyeing 63 points? Neither would have been anywhere near the conversation for 60+ points prior to the season. Four rookies are on pace for 60+ points, led by the extremely impressive Brock Boeser, while Joe Thornton is amazingly the only player over 33 on the same path. The Montreal Canadiens are mired in a four-game losing streak and their grip on the top of the Atlantic Division is slipping. They need help down the middle and everyone knows it, making it tough for GM Marc Bergevin to make a deal. Darren Dreger of TSN spoke today about their struggles recently and how broken up the schedule has been for them. He also mentions the defensive side of the ice and how the Habs would like to make incremental improvements there if possible. He does give some good news on the injury front, telling us that Brendan Gallagher is travelling with the team and should be back in the lineup as soon as this weekend. There is a possibility he’ll return Saturday against the St. Louis Blues, but more likely in the second half of the back to back against Boston on Sunday. The Columbus Blue Jackets have made Oliver Bjorkstrand an emergency call up on Wednesday evening, bringing him back to the NHL for the third time this season. The 21-year old Bjorkstrand has played five games for the Jackets this season, registering just one point. Last season the Danish winger really shone in the AHL playoffs with 16 points in 17 games, helping the Monsters win a Calder Cup. He’s destined for the NHL in the long-run, but still needs some seasoning to unlock his full potential. The Colorado Avalanche have made a goalie swap, sending Spencer Martin to the AHL while bringing Jeremy Smith up to the NHL squad. Martin has been shelled in his short time in the NHL, allowing 13 goals in three games. With Semyon Varlomov out, the team has been relying on Calvin Pickard and would like to have a little more depth behind him. Smith, selected in the second round a decade ago, has never made it into an NHL game. He does have a solid AHL resume, including a .934 save percentage last year for the Providence Bruins.